Dana Markos Events; Event Design and Floral Styling: Chronicle: A Media Event for Dana Markos Events!! 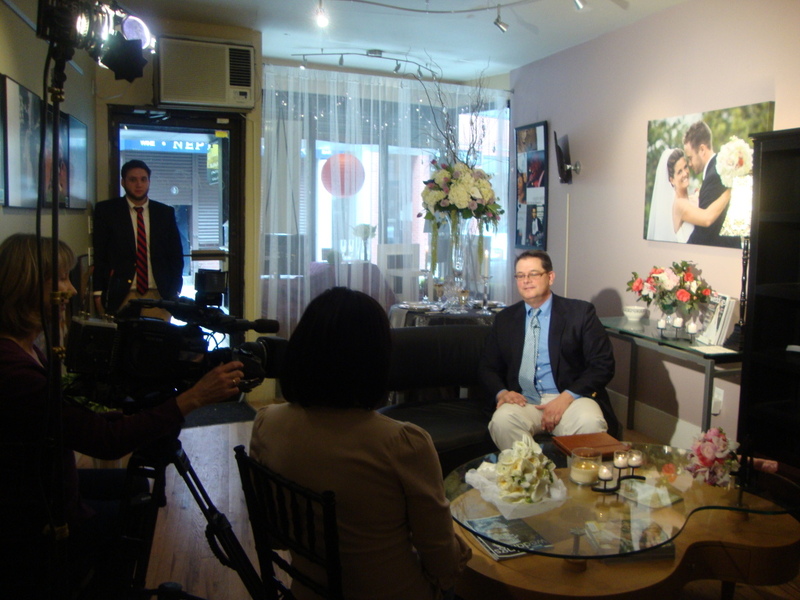 Chronicle: A Media Event for Dana Markos Events!! Well, it all started by seeing a post on Facebook asking if anyone had a Friday Wedding between now and April 15th. 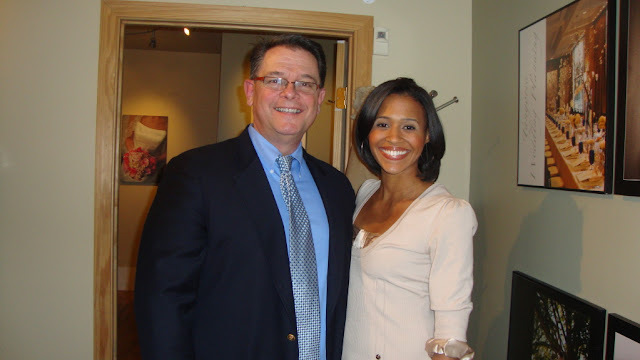 I did, so I sent Shayna Seymour of Chronicle a note telling her the overview of the couple and their upcoming wedding. After a little research on her part Shayna contacted me and said the couple was chosen to be featured for a Chronicle show that will air the evening prior to the Royal Wedding! Very exciting, to say the least! 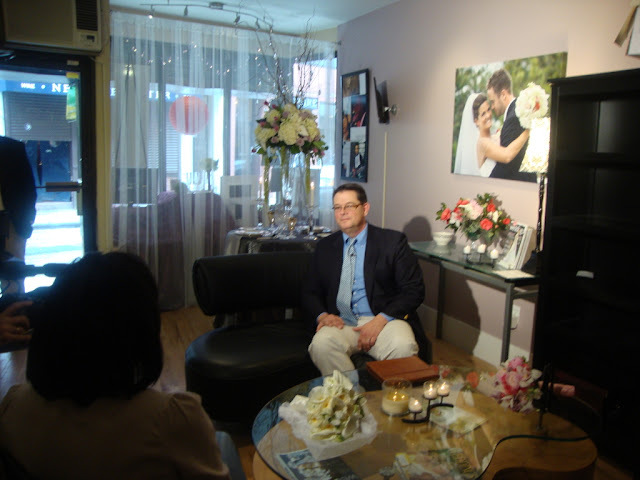 A few days later Shayna called back and asked if I would be willing to be interviewed for a segment, within the show, on the Royal wedding and trends that may be a result of Kate and William's wedding choices. So we welcomed her into the studio last Friday for an informative hour displaying a beautiful table set with fine china, crystal and flatware. For photo opportunities I designed two bridal bouquets and two centerpiece arrangements, one high and one low, to show options of what brides are choosing for their events. The first arrangement we displayed was a low design in a lovely footed crystal bowl featuring all spring colors and flowers. Included was the gorgeous blooms of Camillia. This particular flower was chosen because of its Royal ties. The Camillia was the Queen Mother's favorite flower. In fact, at every home the Queen Mum lived there were gardens of Camillias. At her passing, a bloom was placed with her for all eternity. I would not be surprised to see Kate and William use this flower somewhere in the wedding as they seem to be paying homage to tradition while maintaining just enough of a modern twist to appeal to their generation. For the second arrangement I chose a tall traditional style flute to honor the pomp and circumstance befitting a Royal event. I chose Hydrangea, tulips, roses, hyacinth and sweet pea in a palette of lavenders and whites. Rising from the center were branches of curly willow dripping with crystals to create an opulent look, yet modern sparkle. As if this excitement isn't enough, they will be featuring our April wedding, so you will see that event in its glory. It is sure to be a stunner and promise you it will not disappoint. All in all, a great media event for Dana Markos Events! In addition, other professionals from the industry will be featured and one of our favorite's Person and Killian will be sharing their expertise and incredible talent! We love them!! The show will air on Chronicle Thursday, April 28th at 7:30. Be sure to tune in to WCVB -TV Channel 5. Mark your calendar and be sure to add a foot note to come back, visit our blog and post a comment of your thoughts...we welcome your feedback! Shayna was an absolute pleasure! All smiles awaiting the two bridal bouquets I presented to them at the end of the session! Planners know the most recent patterns, freshest scenes, most sweltering hues, spending plan sparing insider facts, and subtle elements that organizations frequently investigate when they just arrangement a few events yearly. Planning a big event requires someone wedding rentals in san diego to take the time to make the necessary arrangements.